Blood Red Saints have produced an AOR album second to pretty much none in their latest release 'Speedway', however tonight their performance seems a bit muted compared with the performance at their launch party in Bolton a few months ago. Maybe it's because it's the first night of the tour, or they're overawed by playing in London, or they are conscious that, as support act, they are not the main draw and the stage is tiny. However, it is a quiet, reserved performance we see and not the energetic, engaged performance we know they are capable of. It's a tiny bit of a shame as the crowd were disposed to them and friendly, for a London crowd at least, and 'Unbreakable', a monster of a song, goes down really well for an original song in front of a crowd in London that may not know the material. It does not help that the mix does not favour the vocals, but when Pete Godfrey gets a chance to sing on his own the quality of what he is capable of comes through. A sing-along to a Bon Jovi song gets a fairly warm response when introduced much earlier than usual (as in a cover song quite early on) and it's almost as if Blood Red Saints are expecting the worse, when in fact it wasn't going to be that bad in terms of audience response. With only a short set of seven songs or so, given the potential of great songs and quality musicianship, the band never really got going. Next time! 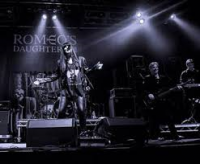 In a bold move Romeo's Daughter kick off with 'Heaven In A Back Seat', their best known and arguably most popular song, but it's a good move; it gets the crowd going immediately and starts the show with a great vibe. Leigh Matty's voice is strong, full-bodied and frankly beautiful enough to bring tears to the eyes. Although Kerrang couldn't decide if RD were Rock or Pop, live they most definitely Rock! It's easily as heavy as Bon Jovi or most AOR bands and not Pop by anyone's stroke of the imagination. Matty is clearly still loving performing with a passion and she has nothing to worry about when it comes to audience reaction, the love coming from the crowd and in the crowd's eyes was so apparent. It is clearly a strong, affectionate love built up over a number of years. Matty gets a wolf-whistle early on in proceedings (her hair being as thick and black and beautiful as it ever was) and feeling the warmth from the audience she remarks she wants to give them all a big kiss. From the look of it, there'd be quite a queue for that one and certain people look misty eyed! 'Bittersweet' shows off her brilliantly gorgeous voice which is literally like velvet and the crowd start swaying and going side to side like a football match UNPROMPTED! For a London crowd, certainly this early in a performance, that is pretty unheard of. 'Alive' sees the audience proceed to fully dancing as though in a club. 'Already Gone' is the closest proceedings probably get to Pop and is reminiscent of a really good Bangles song. 'Keep Walking' and 'Addicted' keep the energy up. Matty announces that 'Cry Myself To Sleep At Night' was first played twenty-seven years ago. The crowd are singing with unbridled passion usually reserved for in the shower, at least in the capital. People literally have their eyes closed in rapture swaying from side to side going full tilt! Matty is humble in the face of such adulation, thanking the audience and acknowledging the role their public play in the band being able to play. She has always been a classy lady, but what a class act RD are! A truly thoroughly enjoyable evening and a reminder that energy is everything when it comes to a crowd. Romeo's Daughter inspired a rare and precious little bit of magic tonight!